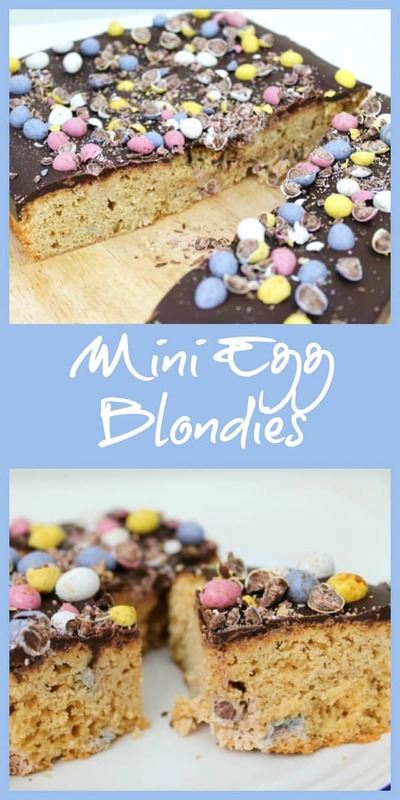 Our Mini Egg Chocolate-Covered Blondies are blondies using muscovado sugar, with mini/micro eggs in the mixture, and then a thick layer of chocolate on top, topped with more crushed mini/micro eggs. I baked these last weekend with my children. 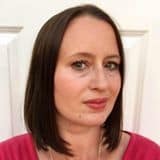 The younger one, who is three, really enjoys standing on a chair and helping with making dinner or baking, while the older one, who is seven, seems to only like baking cakes. Who can blame her really. She did get a cookbook for her birthday recently and is keen to make some recipes from there, so that is promising. 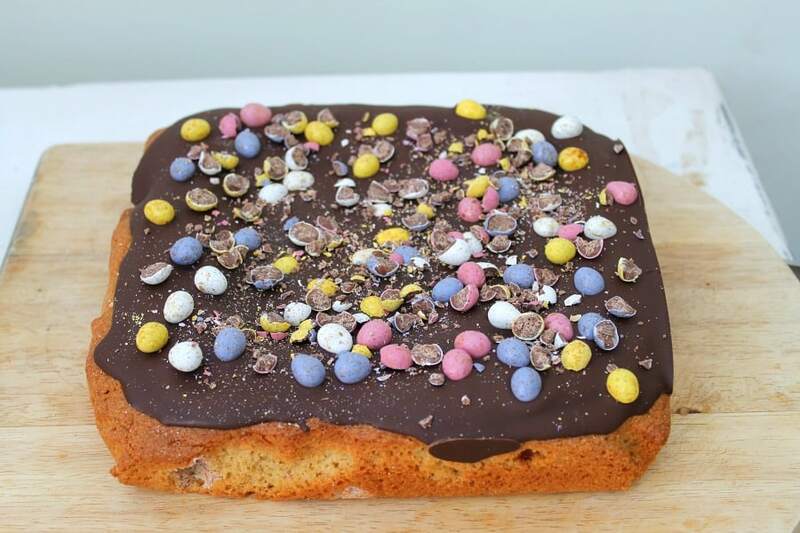 So our latest bake is an Easter one again, this time with mini eggs, well actually these were the smaller micro eggs from the supermarket this time. 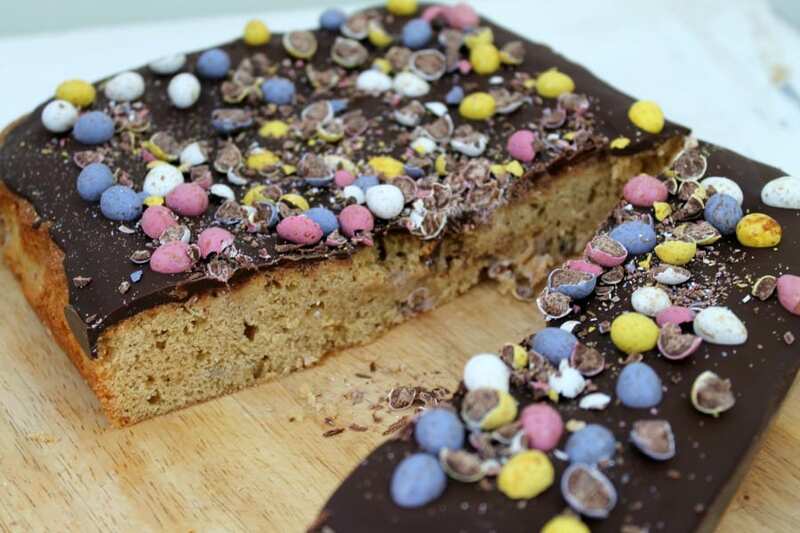 Perfect for an Easter treat! 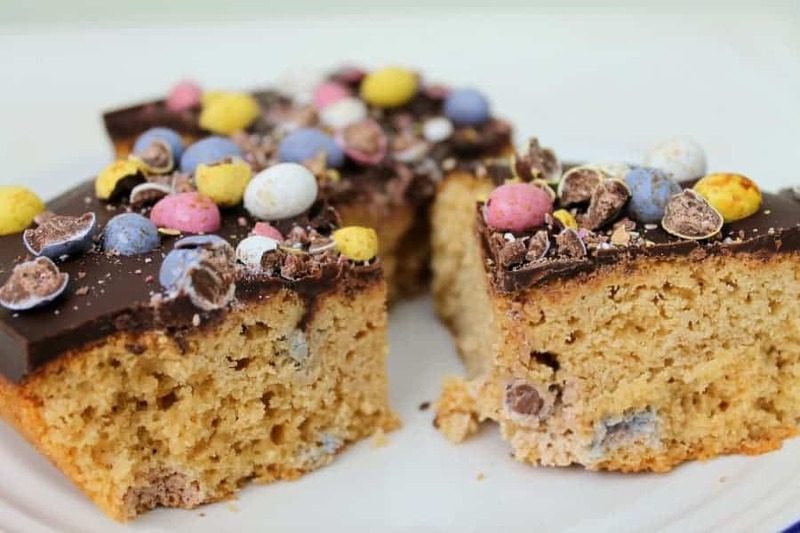 The thick layer of chocolate cracks as you bite through to the soft cakey layer below, and the mini eggs add a splash of colour. All the lucky testers at home loved this, as you can imagine. 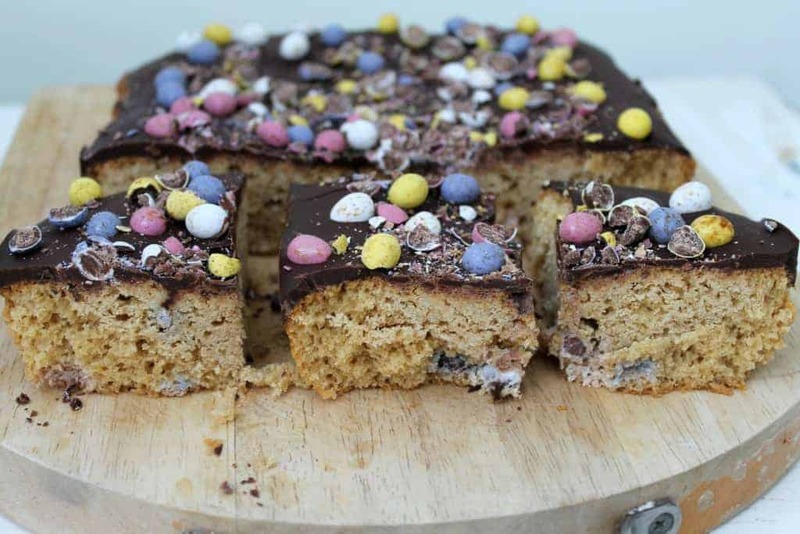 The chocolate layer, which was very thick in the centre where the blondies dipped a little after baking, was my favourite part. It was very easy to snap a bit off the edge to nibble on. Perhaps too easy! Maybe next time I’ll just make some chocolate bark… Anyway, back to the blondies, and you’ll find the recipe below. 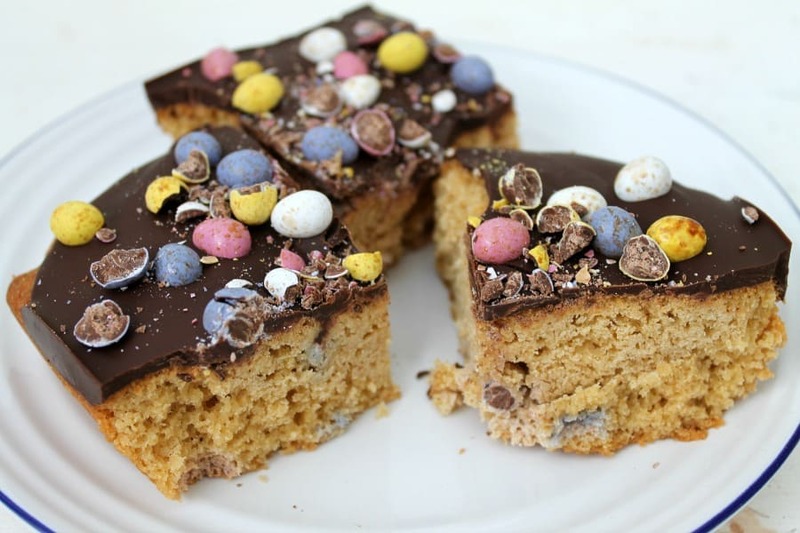 This recipe doesn’t take long to make and my kids loved it so why not bake some mini egg blondies this Easter! Pin these blondies for later!! Melt the butter in the microwave and allow it to cool. Place the sugar in a large bowl and pour the melted, cooled butter over it, then mix until smooth. Beat the eggs, add the vanilla bean paste, and then add this to the mixture. Stir well. Add about 50 g of micro eggs to the mixture and stir gently to combine. Place the mixture in a lined square silicone pan (20 cm). Add the remaining 20 g of micro eggs on top. Bake for 20-25 minutes at 180 degrees until a cake tester comes out clean. Allow the blondies to cool in the silicone pan. Melt the chocolate by microwaving in 30 second bursts and stirring between each burst. It took about a minute and a half in my 1000 watt microwave. Pour the melted chocolate over the blondies, spreading it with a spatula. Put the pan into the fridge to chill. When the chocolate has set partially, you can press some of the micro eggs into the chocolate. When fully set, chop the remaining micro eggs and sprinkle them over the top. Cut with a sharp knife and enjoy a small piece as a treat. I’ve never tried baking blondies before! But this looks very delicious and pretty! A veritable cornucopia of chocolate delights. Lovely.